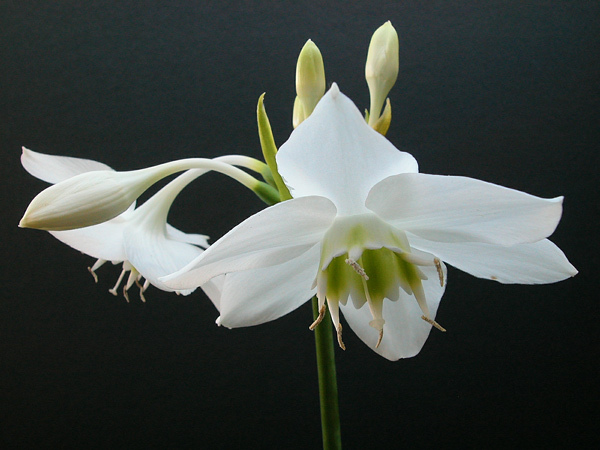 Eucharis is a small genus in the Amaryllidaceae family. 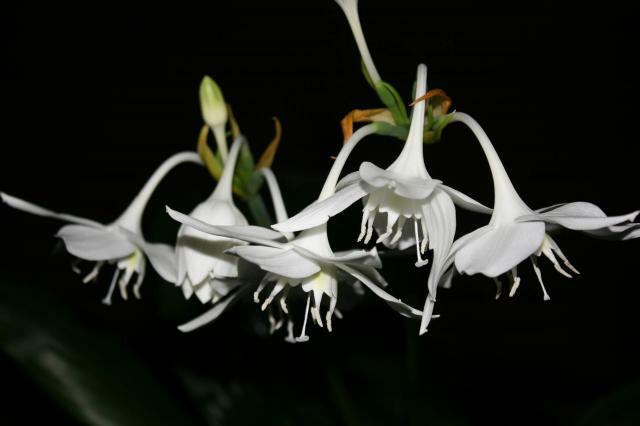 It contains 16 species of rainforest understory with a range from Guatemala to Bolivia. 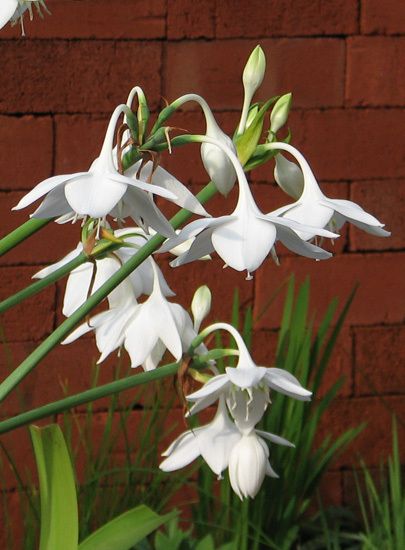 The underground structure is a true bulb with above ground structures as petiolate leaves. The understory rainforest habit means that species of this genus can be grown in situations without much bright light. 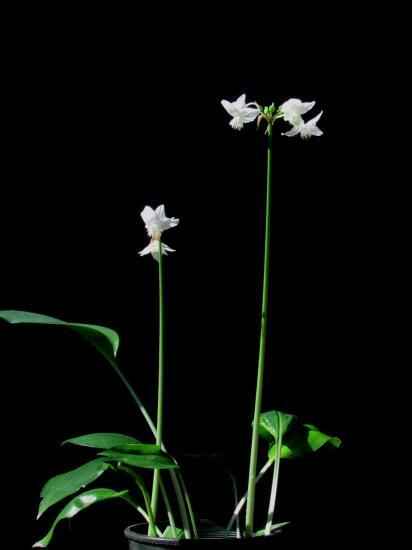 Eucharis amazonica is widely cultivated, although very commonly confused with E. x grandiflora. Staminal cup measures 11.2-13.8 mm long to apex of teeth and 28-30 mm wide, margins are slightly recurved, interior is stained green particularly along filamental traces and shallowly cleft between stamens. 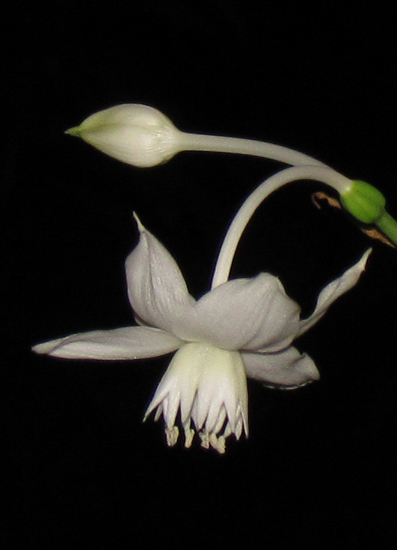 This species has a narrow distribution from Huallaga valley near Moyobamba and Tarapoto, northeastern Peru. This species is at least partly sterile (Meerow 1989). Viable seeds have never been produced in cultivation and the whole population is thought to be a single clone. 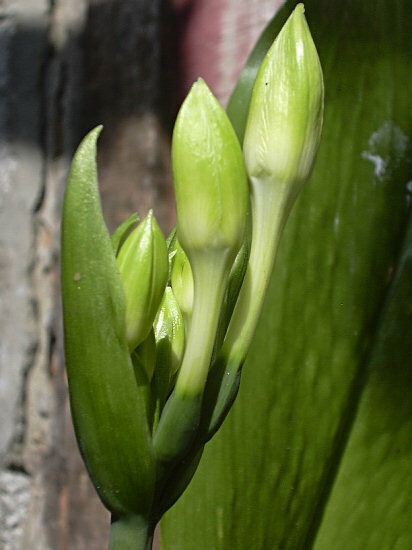 Plants flower at least twice a year, July-August and December-March. 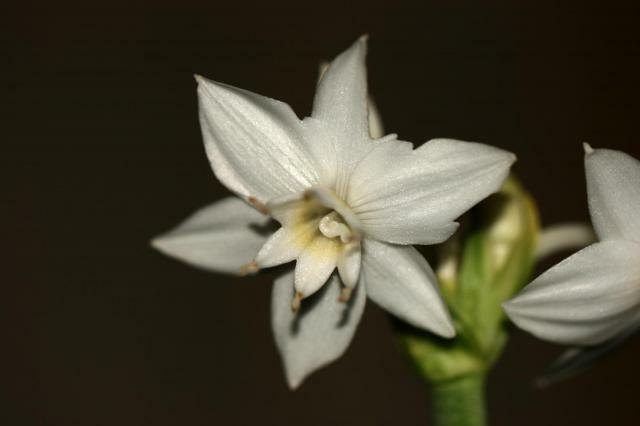 Flower fragrance is sweet and spicy and seems stronger during the day. 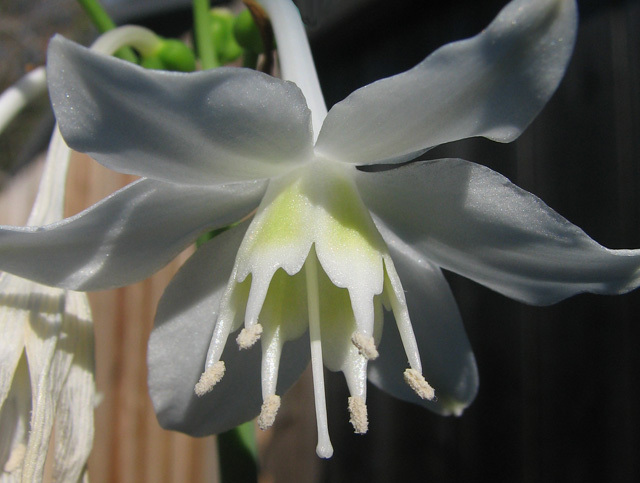 In cultivation, this plant can be grown as a houseplant with little humidity in the air. A slightly sunny window with filtered light is best, although some members find that too much direct light can cause the leaves to scorch. During the active growing season, it also likes a lot of water and occasional fertilizers if possible. The mix should be rich in organic matter but well drained. 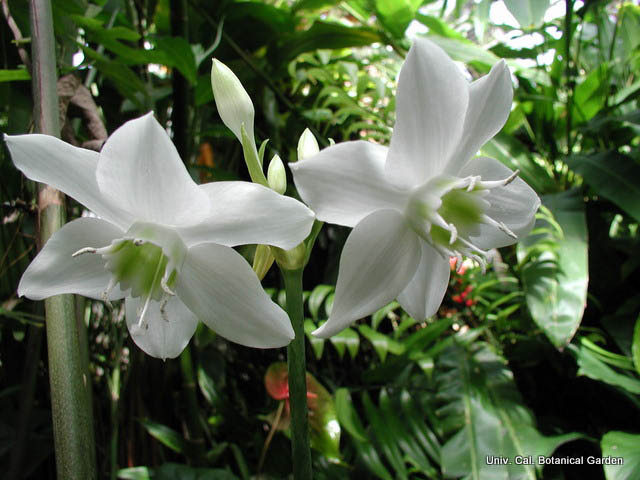 In tropical climates, the plant will bloom naturally without special treatment. 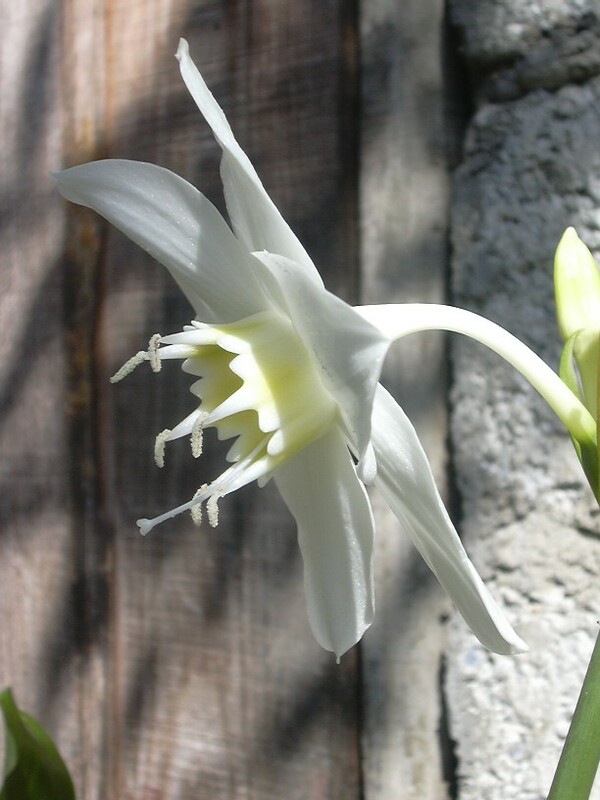 In other climates, drought or temperature stress is necessary to induce bloom. To provide drought stress, during spring and fall allow the leaves to flop a little before watering again (Marc Hachadourian). 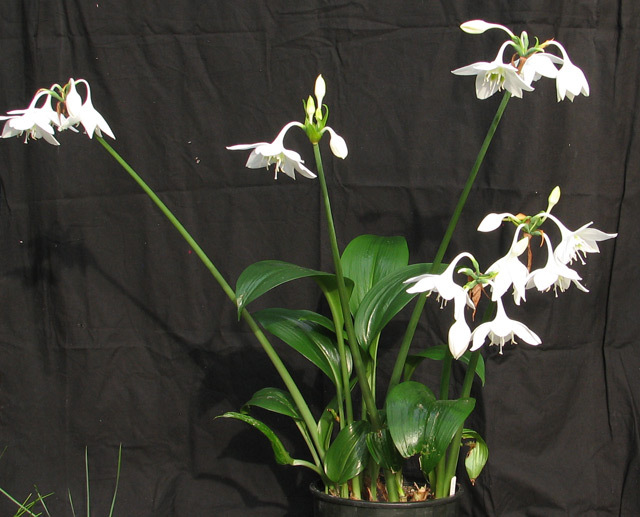 For cold stress, growing at 80 °F followed by a drop in temperature for 3-5 weeks at 70 °F induced a 95% flowering rate (J. van Bragt et al. 1986). The photos below were taken by Nhu Nguyen of a plant that went through major stress, including root disturbance and defoliation. It responded by flowering. 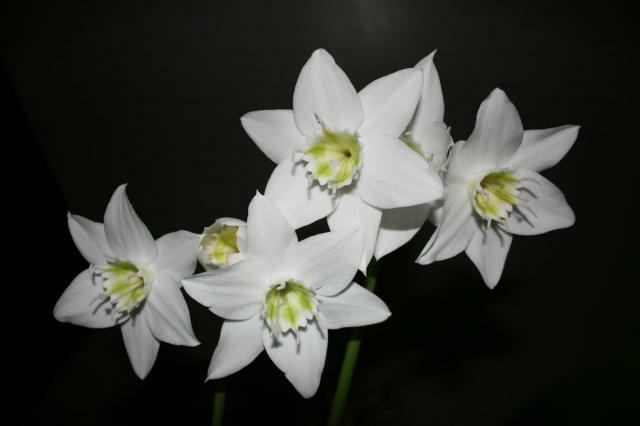 The photos below were taken by Nhu Nguyen showing other views of the flowers. 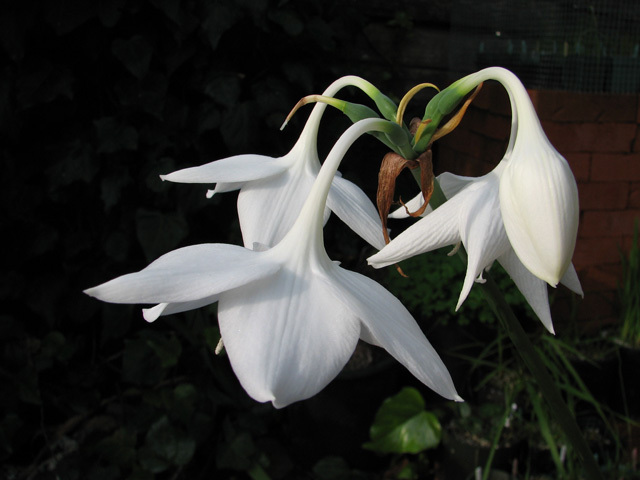 These bulbs were starved of water for a month or two and then watered again. During dormancy, they did not lose their leaves. 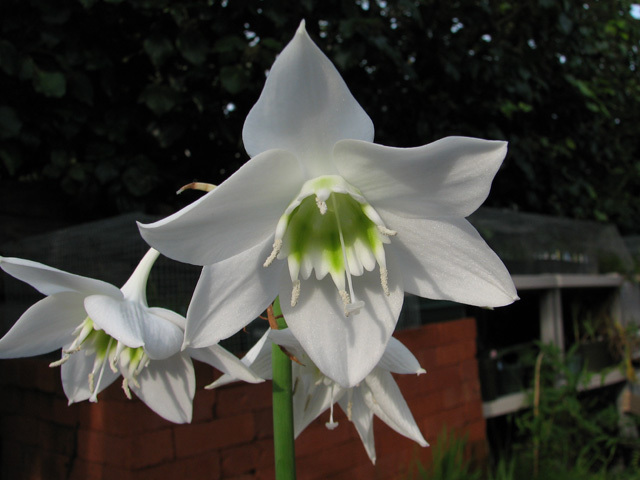 Eucharis astrophiala is native to Ecuador. The name "astrophiala" means "star-shapped cup". 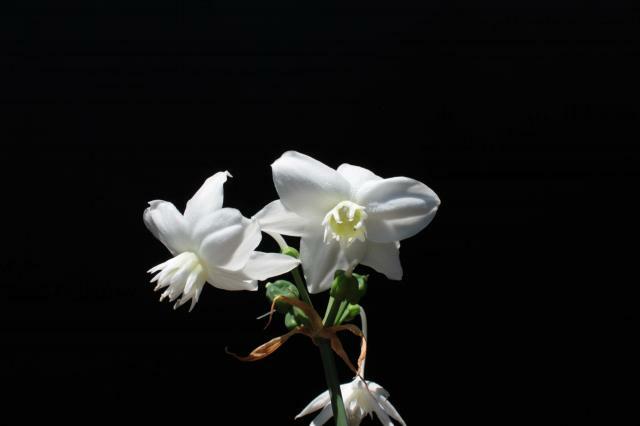 The photos below were taken by Nhu Nguyen of the flowers. 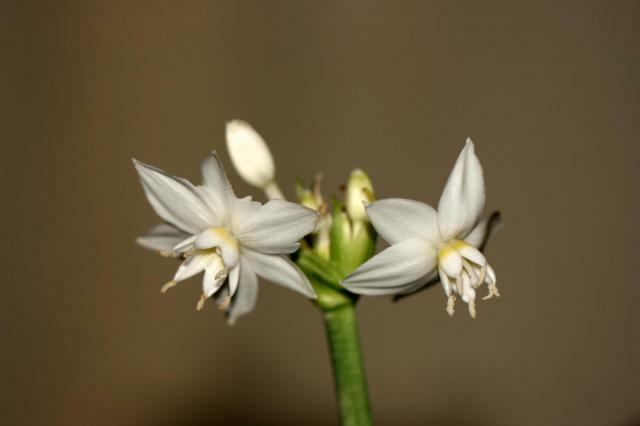 The flowers are small and are distinctive from other species. 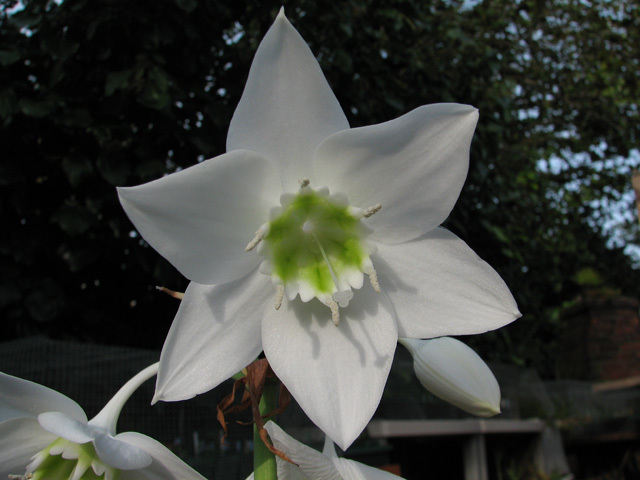 Eucharis formosa is a variable species native mostly to Ecuador, Peru and Colombia. 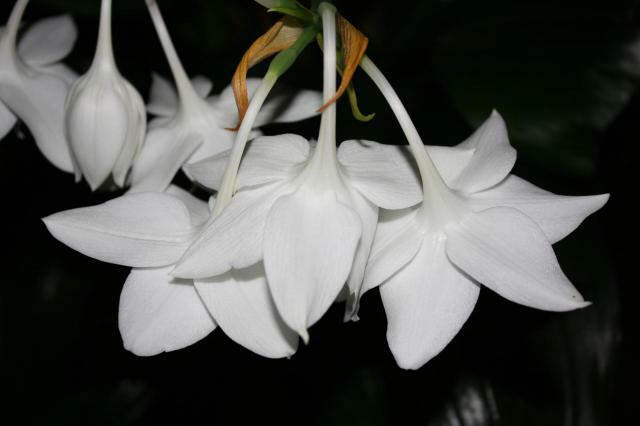 It can be found in rich, moist soil in premontane and lower montane rainforest 100-1800 m (330-5900 ft). In habitat it flowers from January-March. 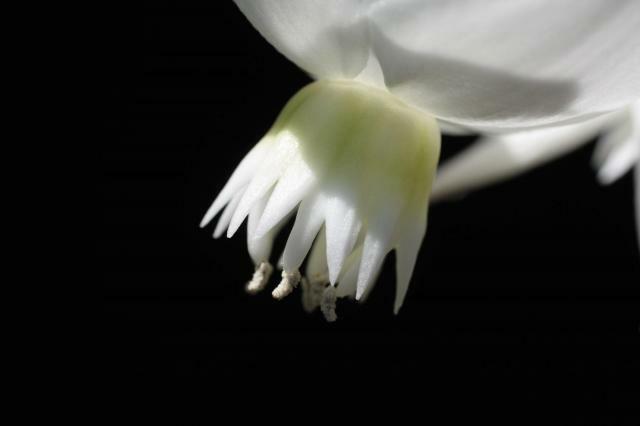 "Floral fragrance slightly fetid; flowers pendent; staminal cup less than 15 mm long to apex of teeth or lobes, cleft 3-5 mm between each stamen, nonplicate; staminal teeth (if present) much less than half the length of the subulate portion of the filament; style exserted ca. 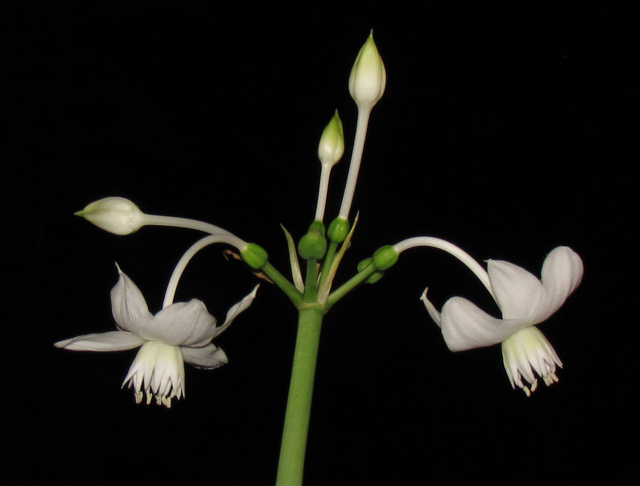 1 cm beyond the anthers" (Meerow 1989). 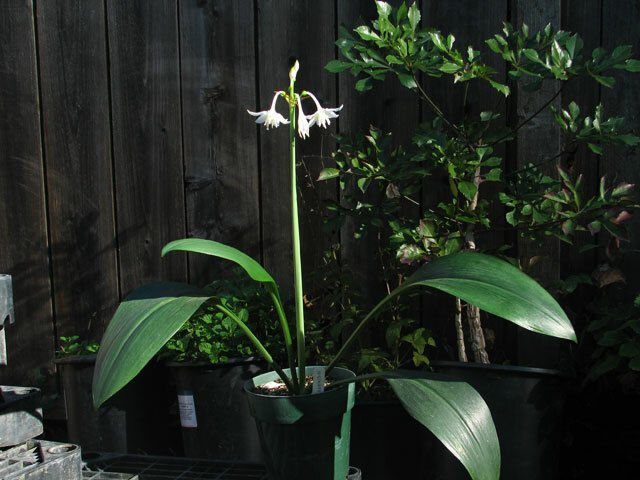 In cultivation it grows well as a houseplant with very little light requirements, although it will bloom better with more than average indoor light. 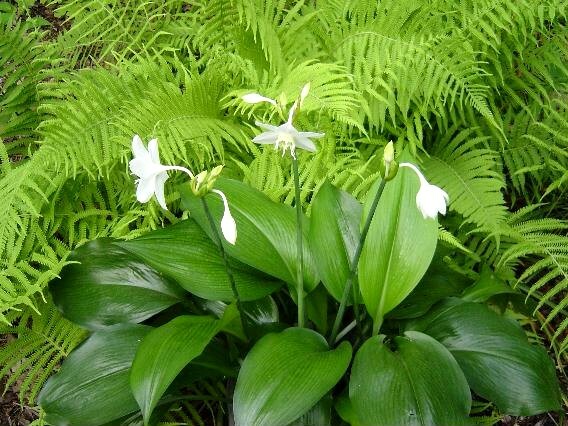 Give the plant a well-drained, high organic mix and water frequently with occasional fertilizer. The strain in cultivation is self-compatible. The photos below from Nhu Nguyen shows seed pods and seed characters. 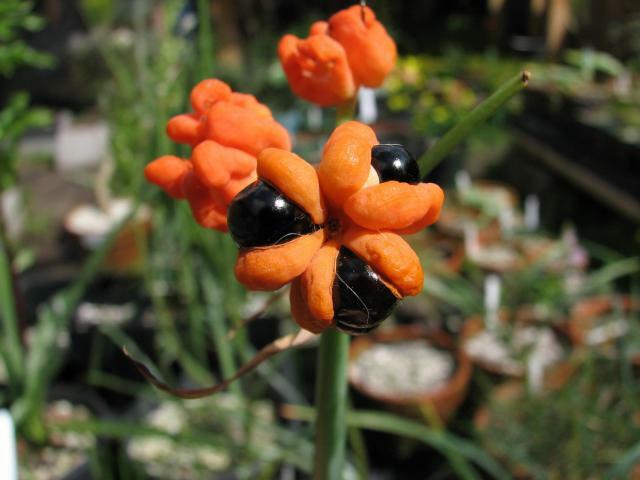 The pods mature to a beautiful orange. 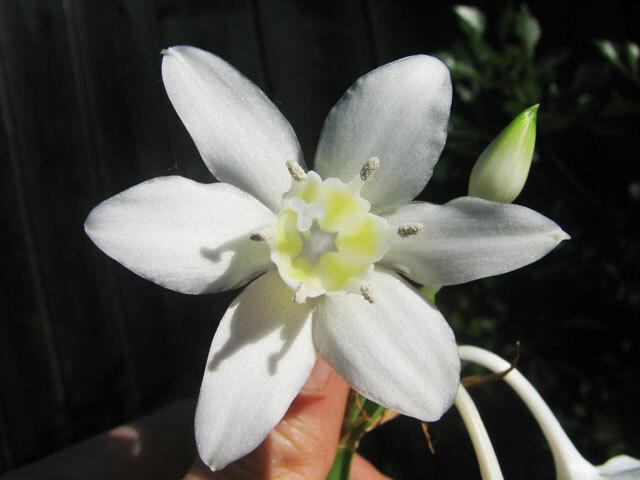 Eucharis x grandiflora is a natural hybrid of Eucharis moorei x Eucharis sanderi that is often confused with E. amazonica. 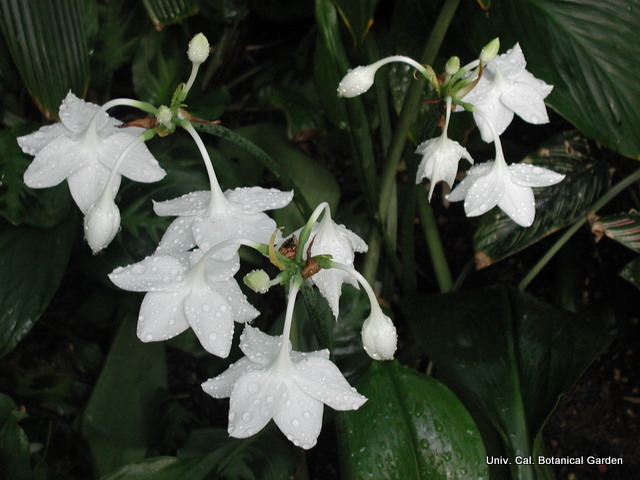 It is found from Colombia to Ecuador, and is one of the few in cultivation. 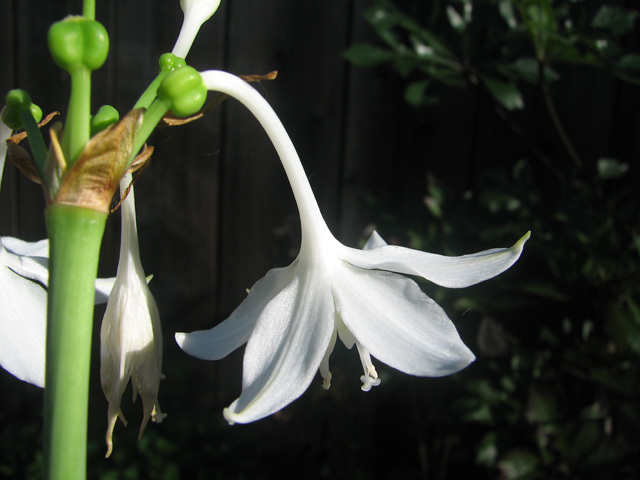 The flowers are white and fragrant flowers. Staminal cups much shorter than 5-7 mm long to apex of teeth, 23-25 mm wide, green in the proximal half, white distally. The first photo is from Sheila Burrow. The second was taken June 2004 by Jay Yourch. 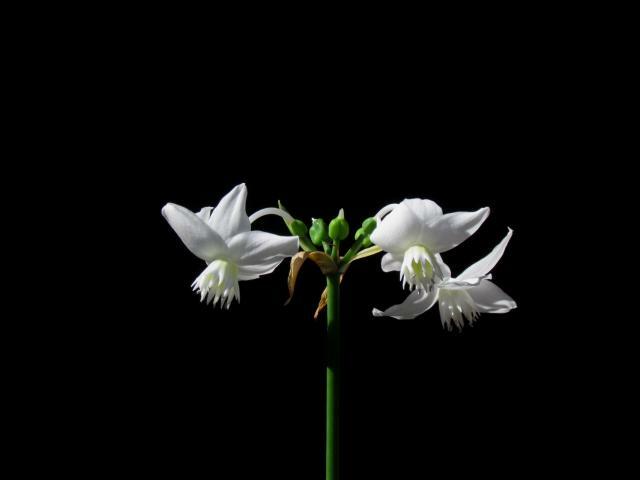 Osmani Baullosa took #3-4 showing the buds and a close-up of a blooming flower. Photos #5-6 were contributed by the UC Botanical Garden. 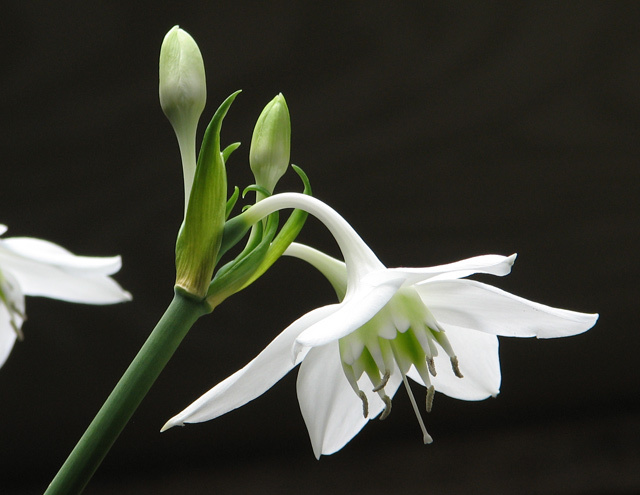 Eucharis plicata is native from Peru to Bolivia. 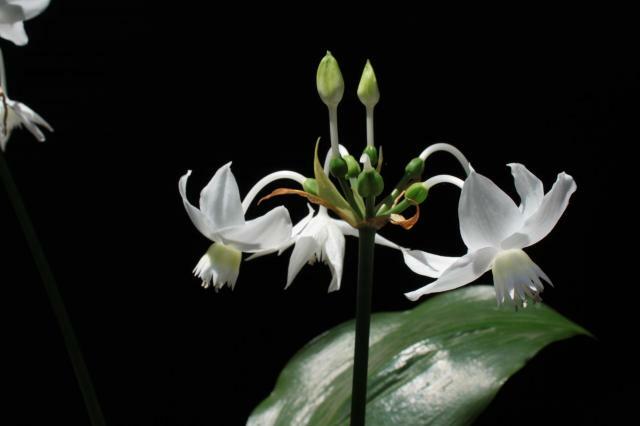 It is found on the understory of wet primary forests. 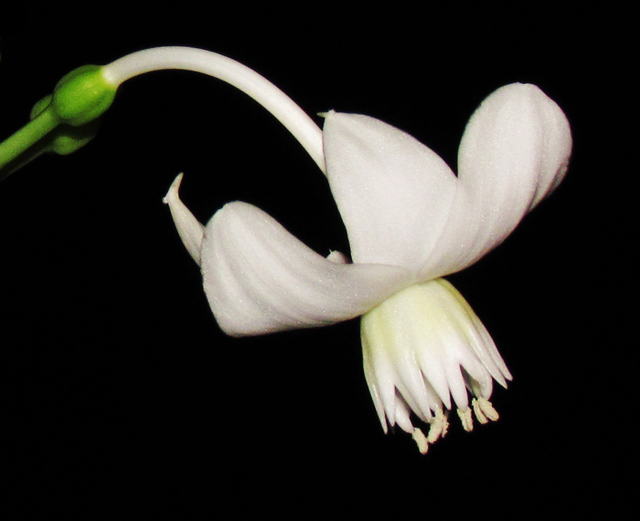 The species is named because of the plicate (pleats) folding of the staminal cup. 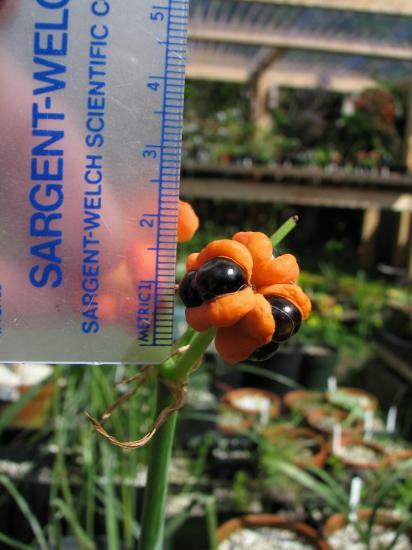 This species is one of the easier ones to grow of the genus. 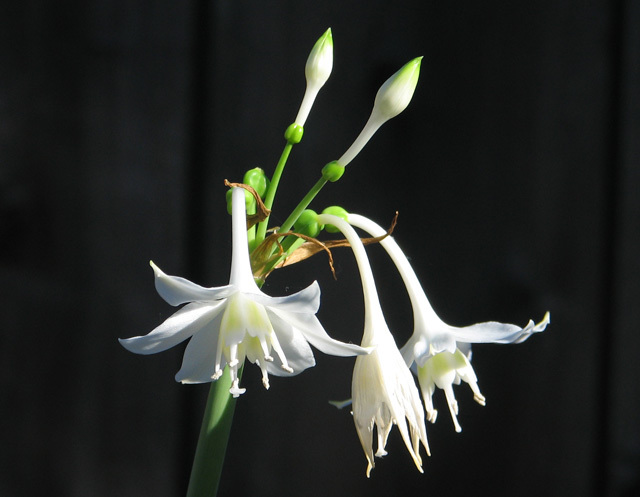 Bulbs can bloom several times a year. Photos by Nhu Nguyen. 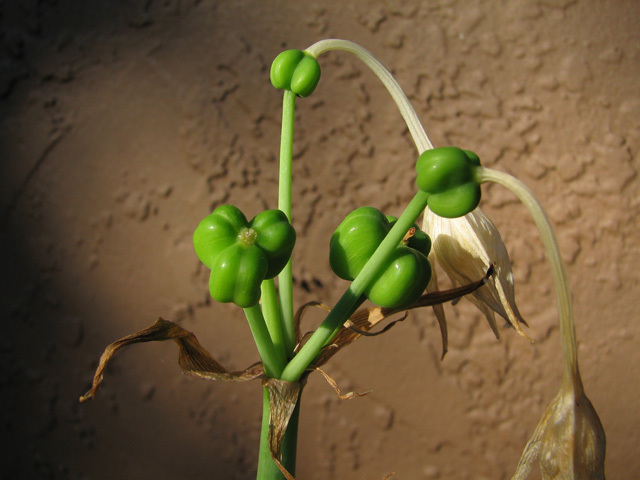 The photos below were taken by Nhu Nguyen showing various aspects of the plants.